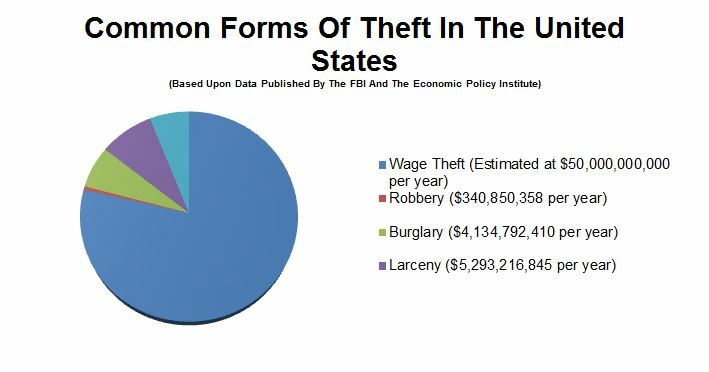 “If you steal from your employer, you’re going to be hauled out of the workplace in handcuffs … But if your employer steals from you, you’ll be lucky to get your money back”. Every year, a staggering number of businesses throughout the state of California take money out of the hard-earned paychecks of their employees through what is known as Wage Theft. Wage Theft occurs whenever an employer fails to pay all wages and benefits owed to its workers under the various laws protecting workers from wage and hour abuses. Oftentimes employees do not even realize that they are being paid less than what they have legally earned. In California, wage theft can arise from a variety of circumstances, including failing to pay employees the state mandated minimum wage; failing to pay for overtime work performed and/or paying overtime at an incorrect rate of pay; failing to pay for work simply because it was performed “off-the-clock”; making illegal deductions from employees’ paychecks; failing to pay employees all wages and penalties for late, interrupted, or missed meal and/or rest breaks; misclassifying employees as independent contractors; or by creating or enforcing various other policies which violate State and/or Federal law. Unfortunately, employees rarely recover their missing wages. In fact, a 2013 study by the UCLA Labor Center found that between 2008 and 2011, California’s DLSE opened nearly 163,000 claims for unpaid wages totaling nearly $400 million; however, workers collected only 42 percent of this amount. The report further found that only 17% of workers who obtained a judgment against their employer saw any money at all during the three-year period. Through its investigations of California labor law violations, the California Dept. of Industrial Relations Bureau of Field Enforcement (“BOF”) identified nearly $38 million dollars of wages owed to employees for the fiscal year running from 2015-2016; however, the BOF was only able to collect approximately $12 million dollars (less than one-third of the total wages owed). Shockingly, in 2015-2016 nearly 85% of all businesses inspected by the BOF were determined to be in violation of California’s Labor laws and subsequently given citations. How Can I Recover Wages Taken By My Employer? Private attorneys who are able to navigate through the difficult process of suing an employer for violating state and federal wage laws regularly help employees to recover their lost wages. Oftentimes these lawsuits are handled on a contingency basis, meaning that the employee does not have to pay an hourly fee to the attorneys and that the class action attorneys are instead paid a percentage of the total amount recovered in settlement or trial. Even when individual wages taken by an employer from one employee appear too small to justify a lawsuit for that one employee, an attorney may determine that the case has merit as a potential class action. These cases require a current or former employee to step forward as a class representative in order to seek compensation for all similarly situated employees. These class representatives are vital in the fight against wage theft and are usually awarded additional compensation by the Court for the time and effort spent pursuing the litigation. Although there can be no guarantee of success, class action cases to compensate employees for Labor Code violations are often able to force an employer to pay much, if not all, of the wages owed to its employees. For example, Marlin & Saltzman, a leading firm in the practice of class-action employment litigation in California and throughout the country has recovered more than $850 million in class action verdicts and settlements for employees denied proper compensation. Marlin & Saltzman has been instrumental in holding countless employers accountable for wage & hour violations, including major companies such as Wal-Mart ($60 million trial verdict); Allstate Insurance ($120 million recovered); Bank of America ($73 million recovered); Countrywide Home Loans ($15 million recovered); H&R Block ($35 million recovered); Lowes ($29.5 million recovered); and State Farm Insurance Company ($135 million recovered). If you believe that your employer has committed Wage Theft, you should contact an attorney experienced in employment class action litigation today. The attorneys at Marlin & Saltzman would be happy to discuss the merits of your case. For more information about our firm, please visit our website at www.marlinsaltzman.com or call (818) 991-8080. Cody R. Kennedy is an Associate Attorney at Marlin & Saltzman, LLP, experienced in complex litigation proceedings. Mr. Kennedy’s practice focuses on matters ranging from employment and consumer protection class actions to mass tort litigation.